Residents in the catchment area of the massive multi-million Maloti Polihali water dam, whose construction is set to commence the Phase II of the giant Lesotho Highlands Water Project (LHWP) in Mokhotlong district are up in arms in demand for a 99 year-long or lifetime compensation for their land which will be submerged by the dam. Community leaders recently noted that the 50-years compensation policy offered to their communities by the Lesotho Highlands Development Authority was a sharp violation of the provisions of the Lesotho Land Act of 2010 when speaking at a gathering held at St Rose, in Peka, organised by rights group Transformation Resource Centre (TRC) and the Sister of the Holy Names of Jesus and Mary recently. Phase II of the Water project entails an the construction of an approximate 163m high Concrete Faced Rock-fill Polihali Dam to sit approximately one kilometre downstream of the confluence of the Khubelu and Senqu Rivers. It will also see a 38km long concrete-lined gravity tunnel connecting the Polihali reservoir to the Katse reservoir that supplies the South African Economic hub province of Gauteng to end acute water supply shortages. The project is expected to be completed by the year 2025 and will increase bulk water supply rate from 780 million cubic metres per year to more than 1270 million cubic metres per year. The MNN Centre for Investigative Journalism understands that as a result of this bilateral Lesotho-South Africa mega Water project at least 573 households from the Phase 1A and 1B have been either directly or indirectly affected. The Centre heard how the Katse Dam (Phase1A) impacted on the livelihoods of 71 households that were displaced, with 2,700 hectares of grazing land and 925 hectares of arable land lost and 20,000 people affected. 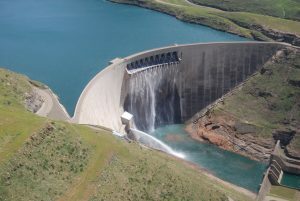 While Mohale Dam (Phase 1B) left 325 households affected and 2, 71 other households lost over 50% of their land and 1,125 hectares of grazing land and 875 hectares of arable land lost, with 7,400 people affected. Now the Centre understands that Polihali dam at its completion and full capacity will inundate 5,040 hectares of land, of which an estimated 1,125 hectors is arable land used by Mokhotlong communities as their source of survival. While the Water project estimated to cost more than M25 billion comes with various developments to the Mokhotlong district, but the residents are up in arms and seek better compensation rates. The demands for better compensation rates, the Centre understands comes as a result of livelihoods to be affected in villages like Ha-Jobere, Ha-Tlhakola, Litšotsong, Tsekong and Ha-Sekantši, where land would be entirely flooded by the 2 080 metres above sea level Water project when at its full capacity and are not in need of resettlement. A further additional three more villages of Tloha-re-Bue, Koung Ha-Phohla and Sekokong, will also be partially below the reservoir demarcation line thereby necessitating relocation. The Centre further understands at least 272 houses from five completely inundated villages are expected to be relocated. A further six villages according to the Water Project’s compensation policy would be threatened due to close proximity to the water body or significantly impeded access. The Authority is currently undertaking the registration of all community assets to be affected by the Water Project, a process that shall lead to the beginning of the compensation policy under fire being applied on the affected communities. The Centre heard how Lehlomela Lekobane, a District Coordinator of a rights group Survivors of Lesotho Dams (SOLD) charged the Lesotho Government never consulted the communities and Basotho when the Phase II agreement was formulated, amid a dark history of community outcries driven by lack of public consultations in the implementation of the phase I of Water Project which included the construction of Katse and Mohale Dams. Lekobane argued government disregarded the communities when entering into a contract that was going to change their lives forever, but never consulted them in the formulation process. “Our concern is with the conduct of the government regarding signing of Phase II agreement for construction of Polihali Dam. In fact, we ask ourselves this one question: when phase II agreement was formulated, how was I involved in this agreement formulation as a citizen of Lesotho? “This is an agreement based on the Land Act of 2010 and its amendments which notes that one has rights to his or her land for 99 years,” he said. Lekobane raise a concern over the length of years the Authority would be making cash payments to all families affected by the project, arguing that the Authority determined 50 years of compensation period is too short and violates the Land Act of 2010 which prescribes 99 years rights to land ownership. Lekobane said they have always wondered with whom the decision to compensate communities to be affected by the Polihali Dam construction for only 50-year period was decided. “It’s true that the Authority always held consultation meetings with us members of the communities, but we always disagreed with their 50 years proposal from the onset. These 50 years originates from the Authority and we wonder with whom they agreed with on them. I wish the water minister could have been here to hear our concerns,” he said. He emphasised; “we totally disagree on these 50 years and stand firm to that. The Authority has a compensation policy that contradicts this country’s Land Act of 2010 which is very clear about the number of years one has a right of ownership to their land, which is 99 years. Why are we not compensated for at least 99 years in line with the law?” Lekonane said. Another community representative, Letsoepa Letsoepa from Ha-Phohla village who also representing the Bokone and Ha-Morojele communities stressed that the project was meant to be a lifetime benefit to South Africa, yet they (communities) are given a 50-years buy out from their land. “Our lives and the way we survived is going to drastically changed because of this project, our lives will not be normal. But shockingly we are promised a buyout of 50 years for land of our forefathers while this project beyond the 50 years is going to continue to serve and benefit South African people. “We do demand a 99 year-long compensation, but we actually want a compensation that will last the lifetime of the dam for our land. If the compensation policy has been approved or passed, then it must be reviewed and amended to include our demands,” Letsoepa said. Kalia Retselisitsoe a community leader Ha-Morojele emphasised the compensation duration highlights a need for relocation of three more villages of Ha-Morojele, Motse-Mocha, Bokone as well as others neighbouring communities. “They are all at a high risk of losing their livelihood once the construction of the dam is complete. They stand to lose their pastures whose large portion will be submerged by the dam,” he said. For his part, the SOLD President, Bolae Matalasi said the communities were not expecting to experience challenges witnessed in the execution of phase I of the Water project but shockingly, its phase II is displaying similar problems. “Our prime and major concern is that the 50 years compensation is too short. We have been saying this at so many different platforms and forum and before different audiences that it has become a song we sing daily without any promising responses. “They (LHDA) know that this is our stance and they have on a number of times told us that we will complain and seek this 99 year-long or lifetime compensation until we given-in because they will never accede to our demands. “I am saying this in their presence; they told us that their offer is 50 years and nothing more. “We thought this water project was going to bring us developments and uplift us from the abyss of poverty we currently live in, but that does not seem to be the case,” lamented Matalasi. Matalasi also added the communities within the Polihali valley set to be turned into a mega water dam are expecting roads infrastructure to be an immediate developments and other corporate social responsibility programs for communities within the district. In responding to the grievances laid out by the community leaders Gerald Mokone, the Polihali Operations Manager notes that despite the Phase II agreement having been signed in 2011 between Lesotho and South Africa, the Authority which is the implementing body of the Polihali Dam project, they prefer land-for-land compensation, a response which brought the communities confusion when compared to the Authority’s policy to compensate affected communities only 50 years. “Of all the issues laid out by the communities, what is differs from our policies fundamentally is the duration for compensation. It is important to note compensation started with a process where communities were engaged from the onset. “We sensitised the communities that, in line with our governing legal instruments, Phase II communities compensation must be done in accordance with Phase I compensation. Meaning all that we have done has been in line with the Phase II agreement,” Mokone said. He further reminded the community leaders that during its engagements with different communities in Polihali, the Authority documented a long list of grievances which he said includes those agreed on and those not agreed on. He noted the authority’s initial offer to the communities was once off payment for their land. “…this was not agreed upon. A large number of the public disagreed saying, they have observed that once off payment have never benefitted those who have received once off payments from different sectors including the mines. They asked to receive their compensation annually. “It must be understood that the Authority never proposed 50 years, but was offering once off payment which the communities requested be paid annually and the Authority accepted that request and advised itself to now follow the Phase I compensation Policy which is embedded in the Phase II agreement, and that is where the 50 years compensation policy came from,” Mokone explained. He nonetheless argued as a result of long running deliberations the annual compensation for 50 year period was never an idea of the Authority but the communities. He explained the 50 years compensation would be a division of the once off payment which the Authority initially offered the communities. “If the communities had agreed to the once-off-payment we proposed, they would have been free to invest their compensation pay-outs wherever they wanted,” Mokone said. Mokone further explained that their terms of compensation includes once-off-payment pay-outs, or an annual payment for a period not exceeding 50 years or receipt of maize and beans annually or alternatively land for land compensation. “Where there is access to acquire land-for land, we take that to be the most preferred form of compensation, although for the few which we have encountered with, they have bluntly refused land for land compensation, which is still a remaining compensation offer that still stands. “It is important to note that of all our compensation offers, the communities are free to change annually,” Mokone said also noting with shock that the community leaders were bringing new demands. Mokone said of all the legal instruments governing the Authority, Land Act of 2010 and the Constitution of Lesotho prescribes that government can seize land from any citizen for development project purposes like this Water Project. “…So what we are doing now is exercising those rights embedded within the legal instruments of this country,” he said. He added that there are no legal instruments in Lesotho which highlights the duration of compensation for whatever development project. “The only article that exists in law for compensation is one that provides that it must be afforded immediately before a person’s land is affected by the development. “There is no clause which provides for the compensation’s duration, therefore the duration was set based the amount of once-off pay-outs and the value in years not exceeding 50 years,” Mokone said. Chief Tšepo Seeiso representing the Principal Chief of Mokhotlong, Mathealira Seeiso, noted the issues raised by both the Authority and the communities were all genuine issues. But, Seeiso said his observation is that “we have a serious problem whereby all parties want to emerge out of the dialogue a winner from and their counterpart losers without considering the need to work together harmoniously for development”. Seeiso said in the absence of a mediator to guide dialogue between the communities and the Authority officials, “it remains that both parties want to flex their muscles and prove they can be winners”. “These issues raised here are a living concern which in my view and advice is that both the Authority and the communities need to reach a common ground”. Seeiso said of the plethora of issues that have brought these two parties at loggerheads is the 50 years compensation issue which “I strongly believe needs to be debated on and addressed in isolation from all other compensation aspects”. He further suggested there is a serious and immediate intervention needed from government to get the warring groups to reach a common ground between the “demand for 99 year-long or lifetime compensation and the 50 years compensation policy”. Now that you’re already here, please help us report more on cases of negligence and other related matters by clicking here. Investigative Journalism is expensive and requires ample resources, we humbly ask that you Click here to support what we do.